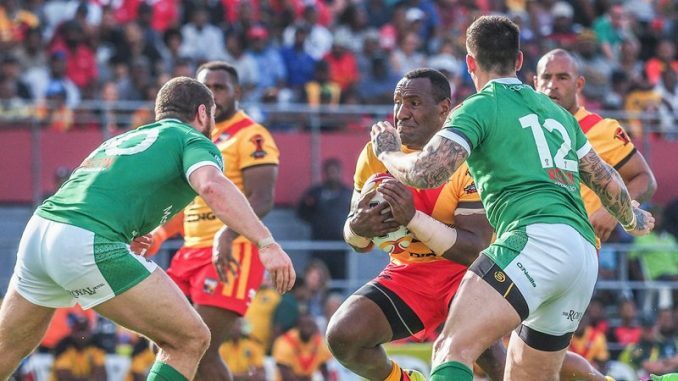 Ireland made it extremely difficult for Papua New Guinea as the Kumuls won 14-6 in Port Moresby on Sunday. Micky McIlorum put Ireland ahead early on but tries from Garry Lo and Nene MacDonald saw Papua New Guinea narrowly lead 8-6 at the interval. Papua New Guinea scored the only try of the second half through Watson Boas late on and game finished 14-6 to the Kumuls. Michael Marum made just one change to his Papua New Guinea side that beat Wales last week as Stargroth Amean came in for Wartovo Puara. Ireland head coach Mark Aston named an unchanged team to the one that were victorious against Italy last time out. Ireland were certainly up for the game and didn’t seem to be fazed by the challenge of facing Papua New Guinea in Port Moresby. They scored inside four minutes when Kumuls captain David Mead failed to deal with a last tackle kick, with Wigan Warriors star Micky McIlorum pouncing on the ball over the line to score. Skipper Liam Finn converted to put his side 6-0 up. The game was very physical as expected, with a big hit from Kyle Amor among the best you will see in the tournament. Papua New Guinea had three straights sets in the Ireland half just before they posted their first points. New Castleford Tigers signing Garry Lo went on a mazy run to get around a couple of Ireland defenders to reach over the line. Rhyse Martin failed to convert but they were only 6-4 behind. The host nation took the lead in the 25th minute as Nene MacDonald showed good strength out wide to get the better of Ireland full-back Scott Grix. The wind dragged Martin’s conversion attempt wide but the Kumuls were narrowly 8-6 ahead. The Kumuls really started to pile pressure on the Wolfhounds defence late on in the first half but Ireland’s outside-backs dealt with kicks very well and managed to keep them out as Ireland went into the sheds 8-6 behind. HALF TIME: Papua New Guinea 8–6 Ireland. Lo thought he had scored his second shortly after the restart but the video referee had chalked it off due to Lo’s leg being on the dead ball line when the ball was grounded. Both sides had decent opportunities to score in the second half but the execution wasn’t there and both sides made quite a few errors which pushed them back. Huddersfield Giants ace Oliver Roberts put on a huge hit on Kumuls star Stanton Albert, leaving the prop feeling worse for wear. In the 71st minute, Justin Olam thought he had scored the winner for Papua New Guinea as he went over in the corner. He had already started celebrating with the fans but the referee ruled the try out because of a forward pass earlier in the play. The Kumuls did secure the two points late on though as Watson Boas capitalised on an Ireland error to score. Martin added the extras to seal a 14-6 win for the hosts. FULL TIME: Papua New Guinea 14–6 Ireland. Papua New Guinea: 1. David Mead, 2. Justin Olam, 3. Kato Ottio, 4. Nene MacDonald, 5. Garry Lo, 6. Ase Boas, 7. Watson Boas, 8. Stanton Albert, 9. Kurt Baptiste, 10. Luke Page, 11. Rhyse Martin, 12. Willie Minoga, 13. Paul Aiton. Interchange: 14. James Segeyaro, 15. Wellington Albert, 16. Stargroth Amean, 17. Enoch Maki. Ireland: 1. Scott Grix, 2. Shannon McDonnell, 3. Ed Chamberlain, 4. Michael Morgan, 5. Liam Kay, 6. Api Pewhairangi, 7. Liam Finn, 8. Brad Singleton, 9. Micky McIlorum, 10. Kyle Amor, 11. Louie McCarthy-Scarsbrook, 12. Olivier Roberts, 13. George King. Interchange: 14. Tyrone McCarthy, 15. James Hasson, 16. Joe Philbin, 17. Anthony Mullally.